A virtual machine instance on Google Compute Engine can be controlled like any standard Windows server. Deploy a simple IIS web server to learn the basics of running a server on a virtual machine instance. You'll need a new Windows instance with HTTP traffic allowed. Follow the Quickstart instructions to create a new Windows instance and connect to it with RDP. 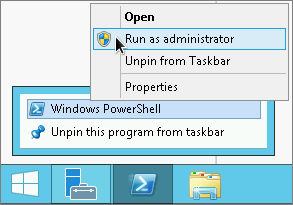 Right click the Windows PowerShell icon and select Run as Administrator to open the PowerShell terminal. Test that your instance is serving traffic on its external IP. Click the external IP for your instance under the EXTERNAL IP column. You should now see the "Hello World!" page. When you're done experimenting, follow the clean up instructions in the Quickstart to avoid incurring charges for this instance. Your VM instance is not publicly accessible because the VM instance does not have the proper tag that allows Compute Engine to apply the appropriate firewall rules or your project does not have a firewall rule that allows traffic to your instance's external IP address. You are trying to access the VM using an https address. Check that your URL is http://[EXTERNAL_IP] rather than https://[EXTERNAL_IP]. Click the name of the instance that you are trying to connect to. Under Firewalls, make sure the Allow HTTP traffic box is checked. If it is not checked, check it. Save your changes. This ensures that the correct tags are added to the VM instance. Look for a firewall rule that allows all IP ranges through tcp:80. Usually, this rule is named the default-allow-http rule. If a rule does not exist, create one. Click on Create firewall rule. Enter a name for the rule, such as default-allow-http. Under Source IP ranges, enter 0.0.0.0/0 to allow traffic from all sources. Under Protocols and ports, check Specified protocols and ports and enter tcp:80.